Argentina head coach Diego Maradona and Argentina’s Lionel Messi walk off the pitch after a 2010 World Cup match. Last week I wrote “Lionel Messi Is Impossible,” an article that explored how play-by-play data sheds light on the Argentina forward’s skills, style and value (spoiler: he’s good). Many readers asked if I could do a similar analysis comparing Messi with all-time greats, particularly Argentine legend Diego Maradona (who played on the winning 1986 World Cup side) and Brazilian great Pele (who helped his country win the Cup in 1958, 1962 and 1970). Ask and you shall receive. Opta, the soccer analytics company, has compiled touch-by-touch data from World Cups going back to 1966, meaning all of Maradona’s World Cup tournaments and two of Pele’s have been logged. This gives us 21 Maradona and eight Pele games to analyze — certainly a small sample, but informative nonetheless. When the modern player is much more dominant than the historical player: That means the modern player is almost certainly better. When the modern player is a bit more dominant than the historical player: That means the modern player is probably better. When the historical player is much more dominant than the modern player: That means there’s some the chance the historical player was better. When the historical player is a little more dominant than the modern player: That’s not helpful in the slightest. The Messi vs. Maradona debate falls somewhere between Nos. 1 and 2. But Messi vs. Pele is somewhere between No. 3 and No. 4. Although we have only eight games in the data set, Pele’s fine-grained statistics over this sample are remarkable. And unlike Maradona, whose career production doesn’t quite match Messi’s (e.g., Maradona had 346 combined club and international goals in 679 career appearances, while Messi already has 407 goals in 548 appearances), Pele’s macro-level stats are formidable. While record-keeping wasn’t as good in the 1950s and ’60s, and there were all kinds of odd unofficial matches, Pele had at least 757 goals in 812 “official” matches — a higher goal-to-appearance ratio than Messi overall — and his peak seasons were even better. For example, in 1961 Pele scored 62 goals in 38 appearances (1.63 goals per appearance!) for Santos FC, the Brazilian club team where he spent most of his playing career. On a game-by-game level, Pele leads Messi and Maradona in goal production by significant margins. Even Messi’s UEFA numbers, while stellar, don’t match Pele’s.3 Pele’s five goals in eight games are a bit below what we would expect given what we know about his goal-scoring in other contexts (for example, Pele scored seven goals in his five previous World Cup games). And, importantly, Pele’s assist rate gives us a rare glimpse into that aspect of his game. If he was nearly as good at distributing the ball over his career as he was during these two World Cups, his value may have been even greater than we previously thought. The Barcelona chart includes seven goals from penalty kicks. The main thing that sticks out is that compared to Messi-A, Messi-B takes fewer shots from distance and has been less successful with them. Maradona was abysmal from distance! But he made a very high percentage of shots inside the box; none of these was a penalty. Pele loved to launch it from long-range, and appears to have done so pretty well. 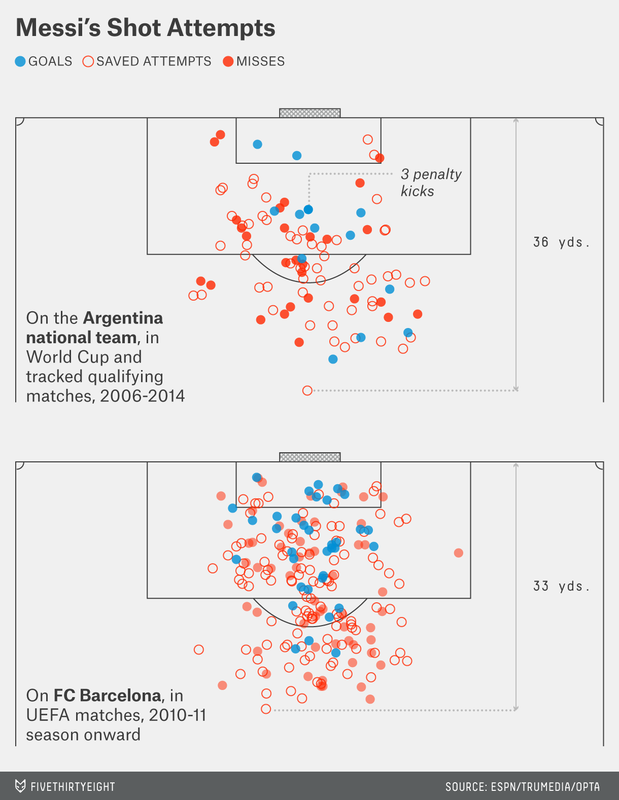 However, I’d note that both of these goals were on direct free kicks, meaning neither he nor Maradona scored from outside the box on regular “open” plays in this data (something that is kind of Messi’s specialty). 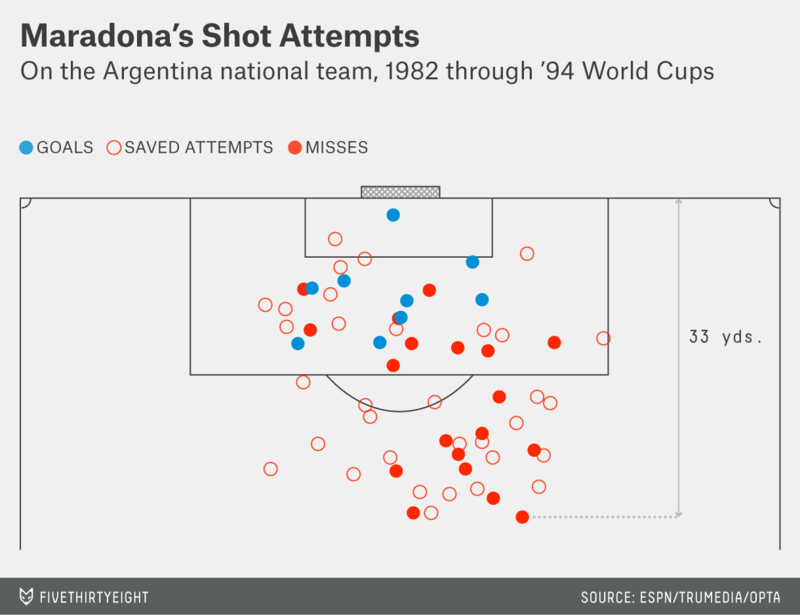 Maradona took on defenders even more zestfully than Messi, and was slightly more successful in doing so. Pele, however, was almost as successful, though he made far fewer attempts per game. I should note, though, that taking on defenders was both more common and more likely to be successful in Pele’s and Maradona’s eras, so this may be a bit of an historical anomaly. In UEFA matches since 2010, teams had an average of about 18 “take on” attempts per game — succeeding 44.8 percent of the time. That’s less than the 21 or so per game by World Cup teams in the Pele and Maradona years; those players succeeded 49.4 percent of the time. Messi appears to be the greater outlier (especially if you consider La Liga, where he succeeds in one-on-one attempts 55.3 percent of the time, while the typical success rate is only 35.6 percent). My main inference from all of this is that defenses are probably tougher these days, which perhaps should affect how we interpret the other comparisons as well. Both Messis attempt more passes than Maradona or Pele did, and both have higher completion percentages and success rates, though Pele’s stats look remarkably similar to Messi-A’s. That final stat, “touches with ‘successful’ pass,” basically tells us how often the player successfully extends his team’s possessions. But how do things go down when he uses the possession himself? Of these “four” players, Pele produced the most goals (through shots and assists) per possession, with Messi-B slightly behind, Messi-A a little further back, and Maradona coming in a respectable fourth. 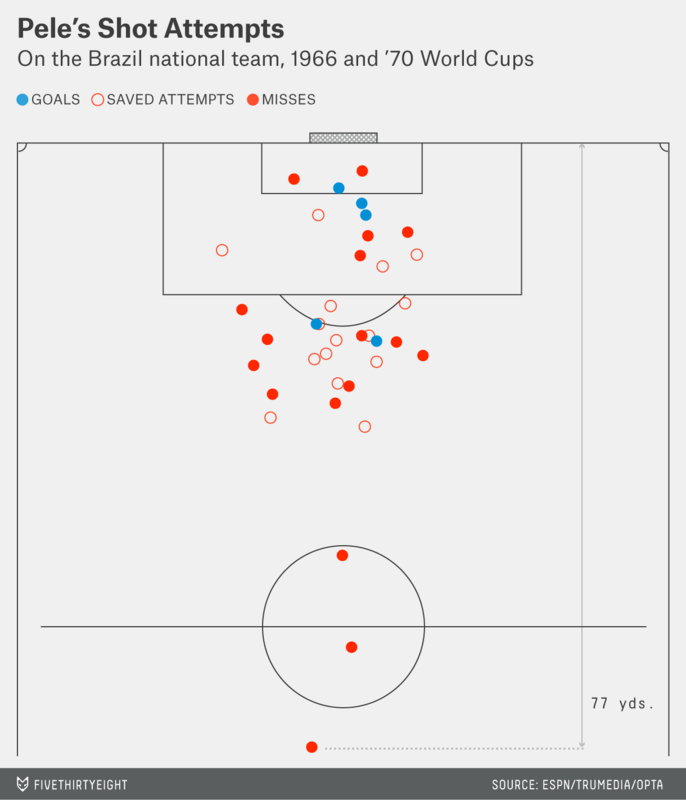 Pele was also much more likely to take or create a shot attempt that missed than to lose possession of the ball any other way, which likely had secondary advantages (as missed shots often lead to rebound attempts, corner kicks, etc). Pele leads in rates of goals plus assists, whether by game or by possessions (as measured by Possession Used). A higher percentage of Pele’s Possessions Used came from missed shots rather than lost balls. Pele took on fewer defenders, but was similarly successful (though Messi is a bigger outlier for his era). Pele’s passing stats (both completion rate and success rate) are a little bit behind Messi’s, but not much. Although Pele’s overall shooting percentage is similar to Messi-A’s and a little behind Messi-B’s, this is largely a result of Pele taking almost twice as many shots from long range. Over this sample, Pele shot about as well as Messi from long range and considerably better from short range. I don’t mean to suggest that this proves Pele was better than Messi: In addition to the historical comparison issues I mentioned, we prefer not to draw conclusions from just eight games of data. But with Pele, we have essentially the opposite scenario. As amazing as Messi’s numbers are — from the career level down to the touch-by-touch level — Pele essentially matches or exceeds them stride for stride. So the thing those eight games confirm is the lack of a conclusive gap between Messi and Pele. In other words, we’ve precluded a simple answer to the Messi/Pele question: If Messi were a substantially more dominant player (even for his era), it would be very unlikely that we’d see results like these. I hope more Pele data emerges, so that we can get a better sense of how dominant he really was, and whether these eight World Cup games were consistent with his overall play (we should expect some regression to the mean just because they’re so good to begin with). But Messi has an opportunity to improve his standing: He’ll be adding more data to his sample Wednesday afternoon, and for many years to come. In other words, the correlation between a player’s skill relative to a previous era and the ability to port those skills into the modern era isn’t necessarily very strong. Note that 2014 alone would be considerably better than average for Messi-A, but we’re comparing all available data rather than cherry-picking each player’s best seasons. It’s perhaps worth mentioning that Messi averaged a considerably higher 1.59 goals plus assists per game for Barcelona in La Liga games, though the significance of those games is less certain because of the extreme imbalance between the league’s top teams and the rest. More detailed shot charts are also possible with this data. Note that Messi’s shooting for both Argentina and for Barca in UEFA matches trails his La Liga efficiency considerably. In regular league games he has made 9.9 percent of shots outside the penalty area and 25.7 percent inside it, for 20.2 percent overall (and even higher if you exclude free kicks, which are a relatively low percentage shots for him). Which is to say, in Bayesian terms, the data confirms our priors.